Uh-oh: Are Redskins fans falling off the RG3 bandwagon? The RG3 lovefest is over in Washington D.C. When the bottom line is affected, you know you have problems. The Redskins are in the middle of a season to forget, mired in the NFC East basement with a 3-9 record. What’s worse, superstar quarterback Robert Griffin III hasn’t been the same as he’s still recovering from offseason knee surgery. And now the fans are talking with their wallets. 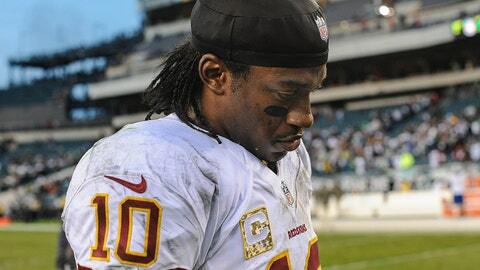 According to the New York Times, sales of RG3’s jersey have fallen off by half in recent weeks. "Ooh, a lot of people are backing off from RG3 right now, a whole lot of people," Antonio Smith, Jr. — a vendor at FedEx Field — said. Smith went on to say that children will approach his merchandise wanting an RG3 jersey, only to have their parents talk them out of it. "Nah, you don’t want that guy’s jersey," Smith said, quoting the parents. "He’s not playing too well, and who know if he’ll play well again?" OK, that’s pretty harsh. But here’s another troubling reaction from a fan after the Redskins’ latest loss on Sunday night. "He should be seeing a sports psychologist or going through some kind of leadership training," said season ticketholder Michael H. Robinson. It seems the goodwill that RG3 built last season is gone, in more than a few fans’ eyes. So, what can he do about it? Nothing really. Bandwagon fans will come and go. That’s what they do. It’s clear just by watching Griffin play that he’s still not 100 percent yet. He just needs to keep plugging away until he is as close to completely healthy as possible. Don’t worry, the fans will come back. But at the moment, it’s becoming clear that the honeymoon is over.